Rabanus Maurus (c.776-856) was abbot of Fulda and later archbishop of Mainz. Between 852 and 846 he compiled The Universe' (also called 'The Nature of things'), a sort of encyclopaedia arranged in 22 books, based on the 'Etymologies' of Isidore. This copy was written at the Benedictine abbey at St. Albans. 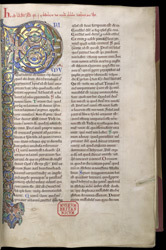 This spectacular initial 'P' is almost as tall as the page itself. Composed mainly of foliage, the bow of the letter also incorporated two pairs of male figures, and red and blue dogs and dragon heads. At the top of the page in red ink is the added ownership inscription and anathema of the Benedictine abbey of St. Albans. The scribe has been recognised in other books from the abbey, confirming that it was made there.